The Grand Canyon is among the most stunning natural attractions in the world. 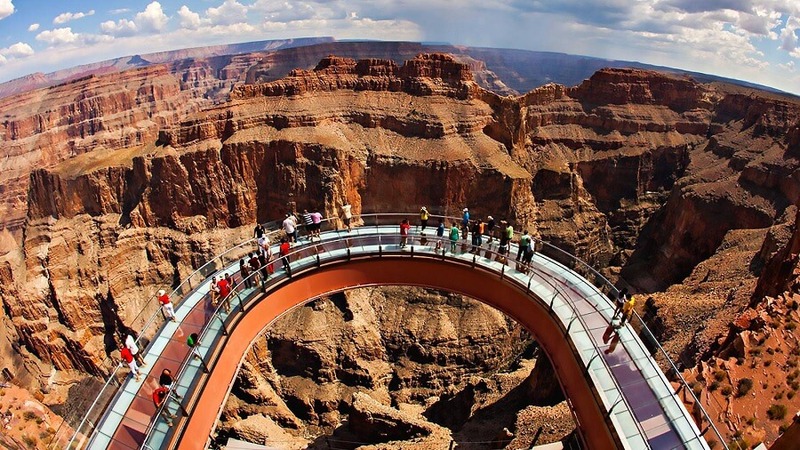 A must-see spectacle in the United States, there are plenty of ways to visit the Grand Canyon. There’s an excellent reason why the Grand Canyon is a world heritage site. It definitely deserves more than just passing attention wherein people get down from their cars, take a couple of shots, and get back in only to drive away. This is one of those incredibly beautiful places that require travelers to invest a bit of time to explore it properly. If you can spare the time to look, you will find several Grand Canyon trip packages online to choose from. Thereby, before you head off to explore this incredible national treasure, do remember that there are several ways to visit the Grand Canyon. We’ve listed the most popular ones below. You need not wait the longest time to book a trip to the Grand Canyon – one of the top US attractions. You can just as easily board a few cheap last minute flights and make an impromptu trip. From our list of the best ways to visit the Grand Canyon, take your pick depending on your travel and tour preferences. What better of the ways to visit the Grand Canyon than to take a road trip! You can drive at your own pace and be in complete control of where to stop and what to look at first. If you are about to visit Grand Canyon from Las Vegas, know that the West Rim is located at just about 2-hours’ drive from the glitzy city. Meanwhile, the South Rim Grand Canyon is approximately about 4 hours away and falls within the bounds of the Grand Canyon National Park. You will be charged around $50 (charges may vary) for admission into the West Rim. The charge includes access to remote viewpoints in the rim. If you wish to access the glass-bottomed Skywalk, you will be charged an additional $30. If you simply wish to enter the Grand Canyon National Park, it will cost you just about $30 per car. The charge includes the car’s occupants and covers a seven-day tour. The entry fee into the Grand Canyon National Park covers access to the North Rim provided visitors are willing to make the 212-mile long drive from one rim to the other. The cost of renting the car and filling it up with gas are additional expenses. It is fairly easy to find and subsequently navigate the Grand Canyon rims. However, parking can be a bit difficult, especially in the South Rim, during holidays and summers. Nonetheless, a vehicle gives you immense freedom of choice when it comes to exploring the Grand Canyon. You can decide what deserves to be the highlights of your trip and how long to stay there. It’s one of the most liberating ways to visit the Grand Canyon. Booking a ground tour of the majestic Grand Canyon is as simple as finding great business class flights. This is among the best ways to visit the Grand Canyon for those not so inclined to drive themselves. By giving control of the steering wheel to someone else, you don’t have to worry too much about planning. However, your Grand Canyon exploration options become somewhat limited. You won’t be as free to navigate your way around the colossal attractions. Your Grand Canyon ground tour can be done via jeep, bus, and other overland tours. To this package, you can add a land trip with an additional float and fly option. Many of the Grand Canyon trip packages cover the labyrinth of hiking trails that can be found on all corners of the Canyon. Most of the ground tour packages offer fixed itineraries with no options of any alterations. This is among the top ways to visit the Grand Canyon for those who don’t like to plan a trip. You can leave the planning to the experts and just enjoy the trip. While you may not have the freedom to choose where you go, it is still one of the best ways to visit the Grand Canyon. How? Well, many of the tour companies have altered their offerings. They now include many of the highlights and Grand Canyon attractions maps will show you. The best way to see Grand Canyon in one day is via a flight tour. You can book a flight tour when you visit Grand Canyon from Las Vegas. Although it can be a bit intimidating for first-timers, an aerial view of the Grand Canyon will leave you absolutely mesmerized. However, do keep in mind that personal exploration is not an option when choosing a flight tour as one of the ways to visit the Grand Canyon. There are a vast number of companies offering a flight tour of the Grand Canyon. The flight cannot stop at any particular spot since its route is already charted out and there can be no last minute change. Some helicopters will land at a spot to allow a closer look at the Canyon on ground. However, even if the helicopter lands, you will not have much of an opportunity to wander far from the landing pad. You will also have very little time on the ground before taking off back to Vegas again. While overland vehicles can travel in any weather, sometimes flights can be canceled owing to unsuitable flying conditions. While it may be very expensive and has limits, a flight tour is still one of the top ways to visit the Grand Canyon. Not everyone can boast about being able to enjoy a bird’s eye view of the spectacular Grand Canyon. It’s a one-of-a-kind opportunity and you will be glad you took it once the tour is over. From the list of the best ways to visit the Grand Canyon listed above, find one that is best suited to you. Book discount flights to USA and enjoy exploring the fantastic Grand Canyons like never before! When is the Best Time to Visit Disneyland 2019?